KEEN Gamers participate in Extra Life to help sick kids again this year. We’re still on a mission three years in. Why? Because helping to save kids is important to us and we need your help! This November 3rd, we’re joining Extra Life’s Game Day, which is a 24-hour gaming marathon fundraiser in support of the Stollery Children’s Hospital Foundation. Extra Life unites thousands of gamers around the world to play games in support of their local Children’s Miracle Network (CMN) Hospital. In Edmonton, our CMN hospital is the Stollery Children’s Hospital. The Foundation raises funds for the Stollery and its vision is to give the sickest kids the best chance, anywhere in the world, to live a long and healthy life. We, KEENers, support that! 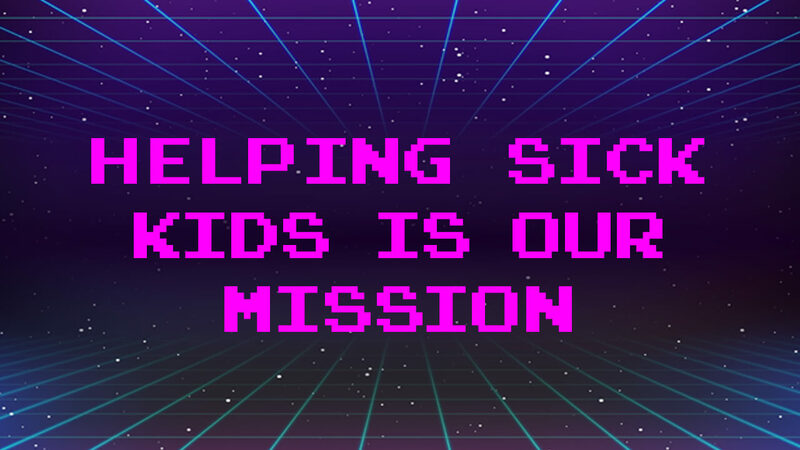 On November 3, we’ll be playing video games, tag, hide ‘n seek, board games – actually, any game to be honest – for 24 hours with donations supporting the Stollery. To learn more and support the KEEN Gamers, visit KEENgeek.ca. In preparation for the big day, we asked the KEENers a bit about their favourite games. Check out what our team had to say below. What was the first game you crushed? What’s your favourite game to play and why? I can’t remember the last time I played a video game, but I do love a good board game. Ticket to Ride or Blokus are probably my favourites. Diddy Kong Racing for N64. Mario 64….and more recently Mario + Rabbids. It’s just classic! Involves a little bit of story, a little bit of strategy and, of course, challenges that keep you entertained. Final Fantasy. I had also received a cassette single that I listened to constantly while playing. Any time I hear Enigma’s Sadeness it makes me think of Final Fantasy. Tough question. The last game I was crazy about was Subnautica. It’s a gorgeous underwater survival game; Just loved it. If, however, time put in equates to favourite then it would have to be WoW (World of Warcraft). I’ve been playing off and on since the original and while I take months off, I still seem to come back to it for a few weeks every year. Wait! Since I discovered Redstone in Minecraft I’ve been messing around with that making machines and hidden doors and automated farms. Boy, I am really bad at answering only one game. Destiny when it’s good, Dark Souls when it’s not. Mixed-Up Mother Goose, I was 5, games were had to beat back then. It also taught me to read and use MS-DOS. I’m a huge fan of open world games but I’m going to go with a classic that inspired today’s open world modern games, Shenmue. It was the first game to create a semi-open world environment where time was also a factor. You could take jobs to earn money and buy things. You could run around in a city talking to NPC’s and drive a forklift (it’s all about the forklift). I might have teared up when Shenmue 3 was announced (and yes I contributed to the Kickstarter, best E3 ever). Rust: The slow-paced survival aspect of this game is amazing. There are also moments of intense PVP combat and NPC challenges as well that make it a solid play. The graphics are really beautiful when cranked to 11. The shadowing through the trees during a sunset, the stars at night during a crescent moon or even the full moon glow off of a stream are all stop and pause moments in the game. Crafting is well thought through as well. Donkey Kong, Mario Party, board games. I am not a huge gamer but I LOVED Donkey Kong growing up. All the secret passageways, fun animals, different scenes, just pure joy. Super Smash Bros – Nintendo 64. Mario Kart or Mario Party because you could get multiple people involved and it was always highly competitive. Probably something on Atari – like Snafu. Any Legend of Zelda. Or Final Fantasy. Does Red Rover count? I was oddly competitive on the playground. I’m a huge fan of The Sims. Building and decorating Sims mansions can keep me entertained for hours. Lately, I’m really enjoying the FPS. Like PUBG, Battlefield, Destiny, etc. I think it has more to do with the ‘playing with others’ and the competitiveness of the gameplay. Also, being an older gamer, I don’t have the time I once had, so playing a game like this 30-mins at a time scratches that itch. Saying all that, I’m absolutely terrible at online multiplayer games. I’m usually the one getting schooled all over the battlefield. Remember, you can support the KEEN Gamers by donating at KEENgeek.ca. Stay tuned to our social channels as we get closer to Game Day!